If you were born in the past 70 years you probably share my love of Golden Books. The illustrations in these books are truly little pieces of art. And at the same time, they come across as super cool without trying! 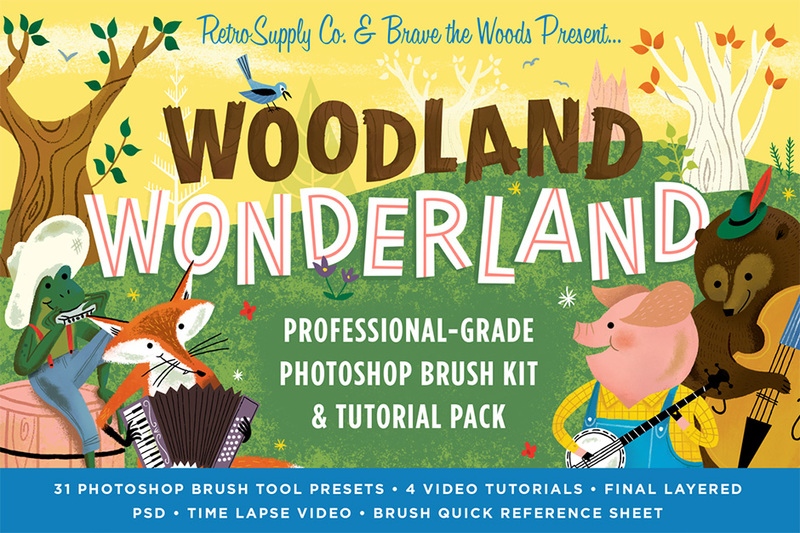 The Woodland Wonderland Brush & Tutorial Pack is inspired by these illustrations. The pack includes 31 unique brushes including gouache, pens, pencils, and conté. Plus, you get some unconventional brushes like Wax Rollers and texture brushes. Please note that only the Premium version is available at Design Cuts. For further details please see the video at 1:34 min. • A diverse pack of 31 brushes inspired by Golden Book style artwork including gouache brushes, watercolor, pencils, pens, form builders, textures and more. • 4 tutorials taught by Brad Woodard of Brave the Woods teach you his process for creating the cover illustration. Includes exactly what brushes he’s using as well as useful tips and tricks. • Reverse engineer the cover illustration for even more insight. Includes well-organized files so you can easily see how the illustration was layered. • The time lapse video is a perfect way to quickly understand exactly how to use the brushes to make amazing illustrations. It’s also fun to watch! • A quick reference guide to all 31 of the brushes (so you don’t need to try every brush to know what it looks like). • A one page, easy to follow guide on how to install Photoshop brush tool presets. • Inevitably we end up doing updates to these brush packs. Often adding extra brushes, adding more videos, or otherwise making little improvements to the pack. When you buy the pack you get ’em free for life. This product will not be featured in a Design Cuts deal for at least 3 months, from May 6th, 2016. File size is approx 73.7MB (99MB unzipped), offered as a single download. Really awesome pack, guys. I didn’t realize there was an option to get a Deluxe package. I’ve already paid for the Premium. Is there anyway I can still take advantage of that? Thanks. I have just sent you a quick email to get some more information from you. I hope it helps, David, and please don’t hesitate to contact me should you have any other questions. I’m always happy to help! Thanks for the quick response. Did the email already get sent? If so, I wasn’t able to see it in my inbox or spam folder. Just in case here’s my email address dave@houstondesignworks.com. I just responded your email, Ben. Thanks.